When it comes to making healthy lifestyle choices, I think it all comes back to the micro- and the macro- ... the unavoidable ultimate truth that we are all connected: individuals, groups of people, and the environment. If we are bombarded by any single substance, in our bodies or around us polluting the planet, we are bound to suffer. This seems to be the case with diet, where most things in moderation are ok. But if patterns are repeated endlessly or substances consumed in huge quantities, health risk seems inevitable. On a larger scale, products we use daily end up not only in our bodies, but in our landfills and our water supplies, and may be creating health hazards from the moment they are produced, until their supposed eventual breakdown. Look into how much plastic currently exists in our oceans: it is not a pretty picture. While pretty much impossible to avoid entirely, it seems worthwhile to limit our exposure to (and ingestion of) plastics. Glass and metal are some obvious alternatives, although it pays to investigate where they were made, and whether they are lined with potentially harmful substances. Natural fabrics are another possibility for uses such as lunch bags, particularly if they are organic. It seems that bamboo is actually a grass, not a wood, and is therefore much faster-growing than trees, and does not typically require the use of pesticides. Again, I am still just a beginner at trying to understand sustainability and truly eco-friendly products, but am encouraged to see the existence of such alternatives. Let the search continue... Meanwhile take a look at my new Eco-Friendly page for even more product recommendations. 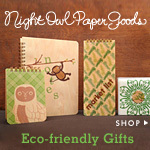 Instead of paying for branding and plastic covers, why not go with recycled paper products? Choose less mass-produced, and more eco-friendly designs by artists and artisans, or decorate them yourself! The possibilities are endless.